The mother-daughter relationship is a subject with seemingly endless possibilities for contemporary comedy. Cancer, however, is not. 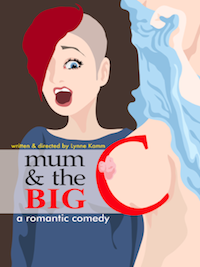 Writer/director Lynne Kamm attempts to navigate both subjects in her new play in the Toronto Fringe Festival, Mum and the Big C.
The draw for me was the chance to see stand-up comedian and media personality Elvira Kurt in an acting role. Kurt plays Ripley, a playgirl, commitment-phobic lesbian who returns to the suburbs to care for her nagging, know-it-all mother Donna (Janet-Laine Green) who has recently been diagnosed with breast cancer. The situation between mother and daughter gets especially awkward after Ripley unknowingly, um, shall we say “shanks”, her mother’s oncologist Maddie (Megan Fahlenbock) and hilarity ensues … sometimes. In her notes in the house programme, Kamm mentions that the entire production only came together in the past month from script to stage. Subsequently, the show does have a workshop feel to it and is still very much a work in progress. I found the characters lacking in depth, they don’t develop far beyond their initial archetypes. Donna is the overbearing mother, Ripley her rebellious daughter. They banter back and forth for much of the show and granted there are flashes of brilliance in some of their exchanges but in the end both characters still come off feeling a little one-note to me. I felt that the show was struggling a bit to find the right tone. The tone of the humour is not quite irreverent enough to be subversive, it’s not quite what I’d describe as dark comedy but it’s not all light, network TV sitcom fare either. I also found the treatment of the subject matter a little superficial. The fact that Donna has cancer is treated a little too matter-of-factly and I think there were a lot of missed opportunities to explore the deeper issues patients and their families deal with when they are coming to terms with a disease. Kurt is fun to watch in the role but I’m not sure the material lived up to her potential as a comedic actor. The ensemble’s delivery comes off a little too sketch-comedy in style and the few somber moments that would keep the production grounded can’t find their weight. The show has some genuinely funny moments, there’s potential there but I think the script still needs work and the show needs more time to develop. While I don’t think a show about how a disease affects a mother-daughter relationship necessarily needs to moralize or be didactic I still think it needs to figure out what it’s trying to say. In the world of the Toronto Fringe, where most productions are limp, story-less one-handers, where actors complaints about their day-jobs are more-than-often the only fodder for dialogue, this clever, witty script, deftly performed by a stellar cast is a stand out. Are you being harder on this show because of the established cast? The subject matter is delt with a light touch, in a lovely comedic tone and I was not the sole audience member entertained and charmed. This production will be a Best of The Fringe winner and your review is so off the mark. PS I am not associated with the production in any way. Janet-Laine Green’s as Donna saved the play. Watched it yesterday with 5 friends and all of us found the characters lacking in depth.